Looking for some great warm weather entertainment for your kids? Buying an inflatable water park might just make you one of the coolest adults in the neighbourhood. Inflatable water parks are a great source of entertainment for kids in the warmer months, and having a water park right in your own backyard means less travel time for the whole family. With an inflatable water park, you can entertain your kids and their friends in the comfort of your own backyard, without ever having to leave the house. Plus, you won’t have to take vacation time to have a blast with the family this summer. Buying an inflatable water park is an investment, so you should do some research before you spend the money. Safety should always be your top priority. Make sure that your inflatable water park comes with anchors to firmly secure the water park to the ground and prevent slipping and dislocation. You should also look for an inflatable water park that is durable and can endure endless hours of play from your kids, and probably other kids in the neighbourhood. 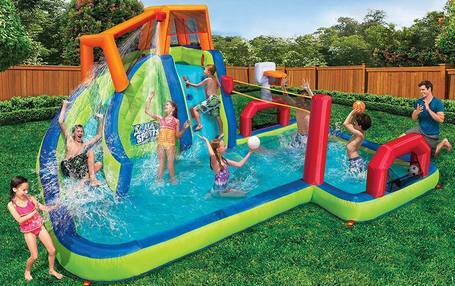 Also, think about what kind of inflatable water park you want: do you want lots of splashing room, or a more compact unit that will take up less space in your yard? How old are your children, and what kind of activities do they enjoy? These are the kinds of things to keep in mind as you shop around. Finally, make sure you get the most fun for your dollar! There are lots of inflatable water parks out there, so try to find one with as many fun features as you can. 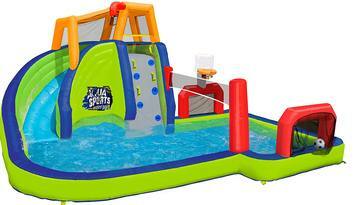 They often come with slides, water guns, bounce areas, and other fun features for your kids. Your kids will surely appreciate your attempts to maximize the amount of fun that they can get from their inflatable water park. This inflatable water park sure to be a blast for the whole family. Safety: The Pirate Bay is built to keep kids safe. 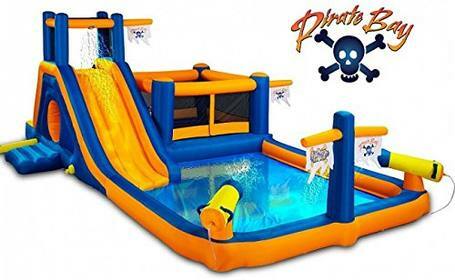 It comes with anchors to keep your Pirate Bay Inflatable Park firmly secured to the ground and reduce slipping. The bounce area is made with soft safety netting to keep kids from falling out and to prevent uncomfortable abrasions when rubbing against the netting. The climbing areas also contain lots of footholds and safety handles to prevent falls. Size: The Blast Zone Pirate Bay Inflatable Water Park is huge. There is lots of room in the Pirate Bay splash area for the whole family, or the neighbourhood kids, to hang out in. Kids can play in one side of the splash area while others come down the slide, so there is enough room to avoid collisions at the bottom of the slide. 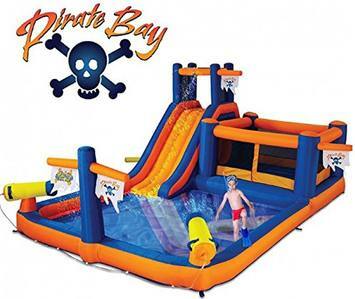 Storage: The Pirate Bay is a large inflatable park, so it can be difficult to put away by yourself. Consider recruiting a helping hand if you can, to make the storage process easier. When storing your Pirate Bay, be sure to let it dry out completely. Users have recommended leaving it outside to dry for a day or two before rolling it up. It can also be a good idea, when storing your Pirate Bay for the year, to blow it up a couple times between drying, to ensure that no moisture remains in the creases. Because the drying process and storage can be so time-consuming, you might want to consider how you could leave the Pirate Bay partially setup between uses, or leave it somewhere easy to access. 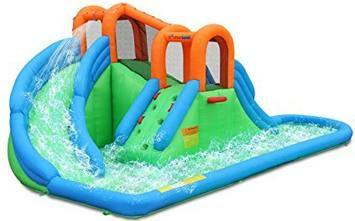 This Banzai Inflatable Water Park is great for kids who are extra active and want lots to do. 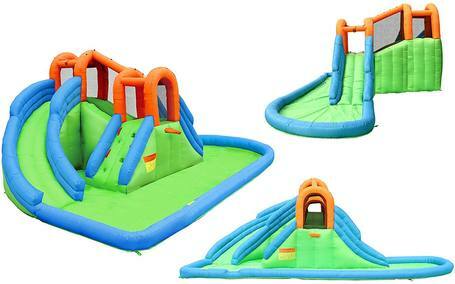 The Banzai Inflatable Aqua Sports Splash Pool is a water park and a water-sports arena. Lots of activities: The three sports games that are built into the Aqua Sports Splash Pool make it easy for kids to entertain themselves with friends. With so many different options, kids are sure to keep themselves busy for a long time. The Aqua Sports Splash Pool is much more than just a splash pad. Size: The Banzai Aqua Sports Splash Pool does not have a large splash pad area for kids to sit and relax in. Some buyers found that the Aqua Sports Splash Pool was not as large as they expected when they opened it. Be sure to check the measurements yourself to get an idea of how large this will be and if it’s the size you are looking for. 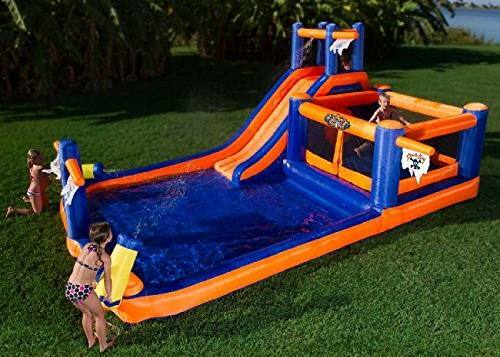 On the other hand, this smaller option could be great for people with smaller yards who have less space to set up this kind of inflatable water park. If you were hoping to take a seat in the small splash area to cool off while your kids play, you might need to beware flying sports balls or crashing kids coming down the slide. 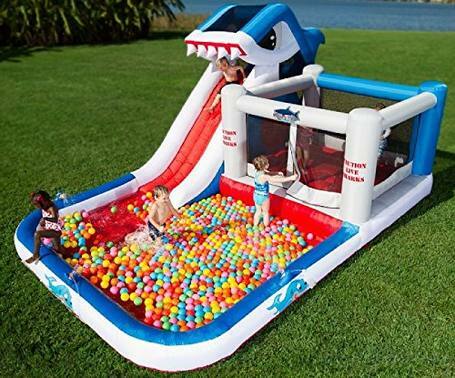 The Blast Zone Shark Park Inflatable Water Bouncer is similar to the Pirate Bay Water Park in its set up. 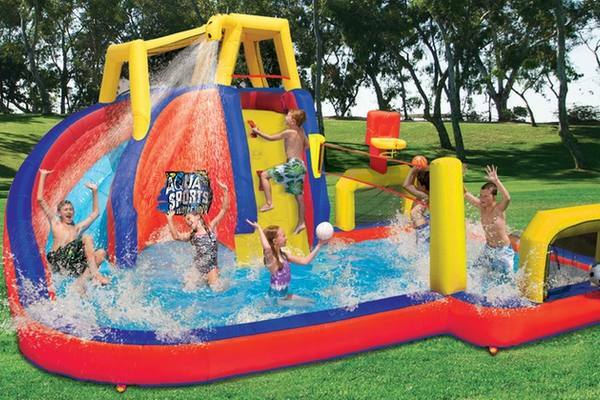 Size: With an 80 square foot splash area, you really can’t go wrong. The Shark Park is a huge play area that is friendly to parents and younger children. 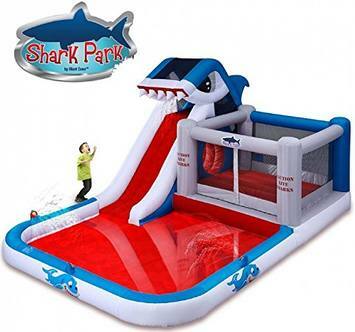 Unlike the Bonzai Aqua Sports Splash Pool, which had tons of activity but little room to relax, the Shark Park can accommodate fun and relaxation. It has room to play on the slide and in the bouncing area but also room for parents who want to sit and cool off, or younger kids who just want to splash around in the shallow water. Customer Service: Any initial defects or difficulties that you might have with Shark Park (because even the best inflatable water parks might have occasional defects) can be easily remedied through Blast Zone’s customer service. Buyers have been very impressed by the service they received from Blast Zone, so you can rest assured that even if you are unlucky and something goes wrong with your new inflatable water park, Blast Zone will be there to help you out and get you back up and running again. Storage: Once again, just like with Pirate Bay, the only real complaint about the Shark Park seems to be that it is so big that it can be difficult to store. The same recommendations apply: consider recruiting a friend to help you take it down and coming up with a plan to store the Shark Park between uses without needing to completely pack it away. The Island Water Park Water Slide is just that – a water slide. It does not have any additional activities like volleyball or a bouncing area. However, if you are in the market for a water slide, this could be just what you are looking for. Durability: The Island Water Park Water Slide is very durable. It is made with heavy duty puncture resistant materials that are intended to protect the water slide from damage and tearing. Also, the seams are made with double to quadruple stitches to reinforce the seams and prevent splitting. Splitting at the seams is a common way that inflatable parks get worn out. Plus, the Island Water Park Water Slide comes with a repair patch, so if you do suffer a puncture or a tear, you have a first aid kit ready to go for an instant repair. As always, be careful when setting up and handling your inflatable water park to ensure that you do not accidentally puncture or tear the material. If you’ve made the decision to purchase an inflatable water park for your kids, congrats! You are bound to be up for a coolest adult in the neighbourhood award. The next thing you need to decide is what kind of inflatable water park you are looking for. Your first decision should be whether or not you want a splash area. If you have younger kids who may not want to always climb the slides and do more intense activities, a splash area could be very important. Similarly, if you would like to be able to cool down in the inflatable water park with your kids as they play, having a splash area to sit in will be important. Make that decision first to decide what kind of water park you are looking for. Note that having a splash area will mean that your inflatable park will be larger, so make sure you have room in your yard for it. If you do want a splash area, the Pirate Bay and Shark Park are both top rated inflatable water parks that are bound to be great choices. Plus, Blast Zone is said to give remarkable customer service, so you can have some confidence in your investment. If you don’t want a splash area, consider the Aqua Sports Splash Pool as a smaller sized inflatable water park with tons of built in activities for your kids. Or, the Island Water Park Water Slide is a great inflatable water slide for kids who want the excitement of a high, curved water slide.